The Willow Warblometer was off the scale this morning in the dunes at Ainsdale as the song of one bird after another cascaded over each other and at times made it hard to hear other calls. At least 30 on my circuit south of the discovery centre. Clearly a further arrival of common migrants had taken place as I wandered in at 0745 with the dunes to myself. Four Groppers now, a Sedge Warbler, two Blackcap, two Chiffchaff, seven Whitethroat, six Wheatear and a steady, if small passage of buzzing Redpolls and one or two Siskins scrawled into the notebook as I settled into my favourite “sitting” dune. As soon as I had my back turned a typically sneaky male Ring Ouzel swept over my shoulder, all powerful flight and frosty wings, before bombing into birch scrub about 200 metres north of the LNR sheep enclosure. It perched up briefly to flip me the finger before disappearing into cover. The Rouzel alone justified getting out of my pit as I headed to my next snoozing dune, I mean observation point, in the LNR sheep enclosure. The Willow Warbler chorus was peaking at about 9am, when a female Redstart appeared in the scrub, flashed her orangey tail, then moved on. 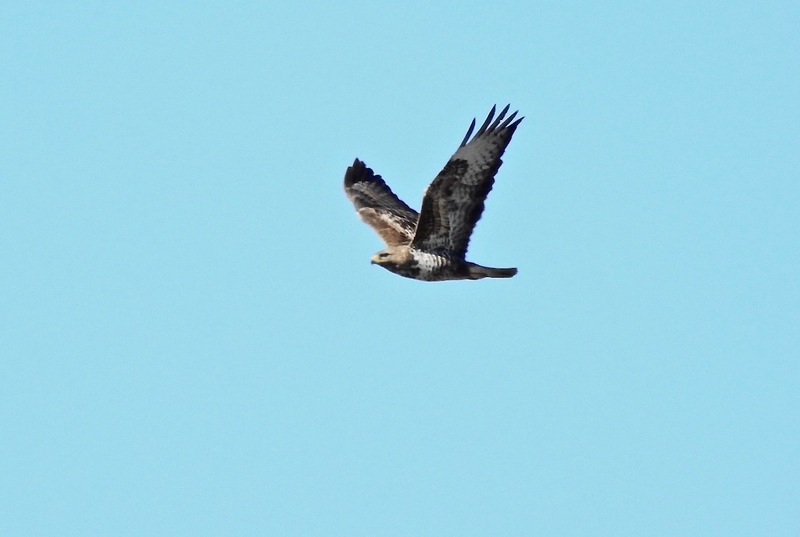 Up to 10 Common Buzzards kettled above the dunes as the temperature started to rise, but hirundine movement was at a trickle – presumably they were high, high up in the blue. To the south, Lapwing and Shelduck were on territory and corvids were targetting the BHG colony. It got a bit quiet after that while I gave the scrub and open dunes a good checking. 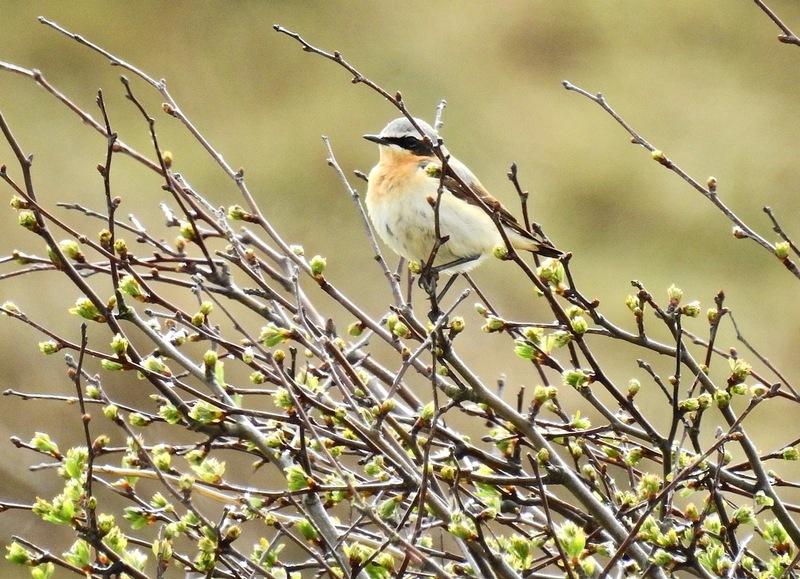 As I headed out I bumped in a peachy male Whinchat, which seemed to be hanging out with a female Wheatear when not getting serious hassle from two local male Stonechats. Whenever the bird settled the Stonechats chased it, and it took about 45 minutes before they left it be. 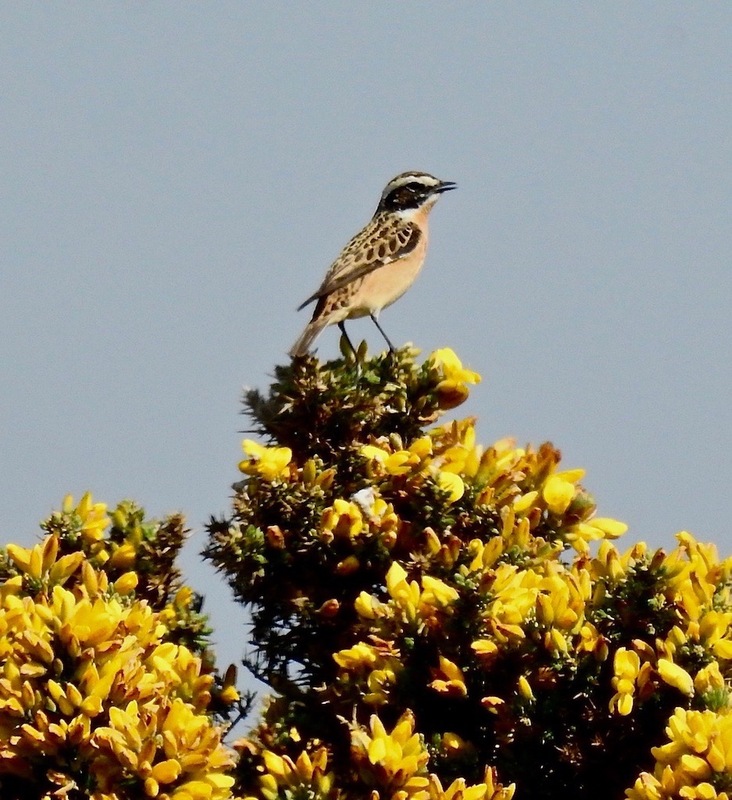 The Whinchat flew up into a flowering gorse and had a bit of a sing-song in between flycatching. And that’s were the “life imitating art” thing comes in, ‘cos a few weeks ago I cleared out my mum’s attic, shredding and recycling all manner of junk from my early years. I did however hold onto a single “Wild Birds In Britain” Brooke Bond Tea card from I don’t know when (but the picture card album is advertised as available “from your grocer” for the princely sum of 6d). 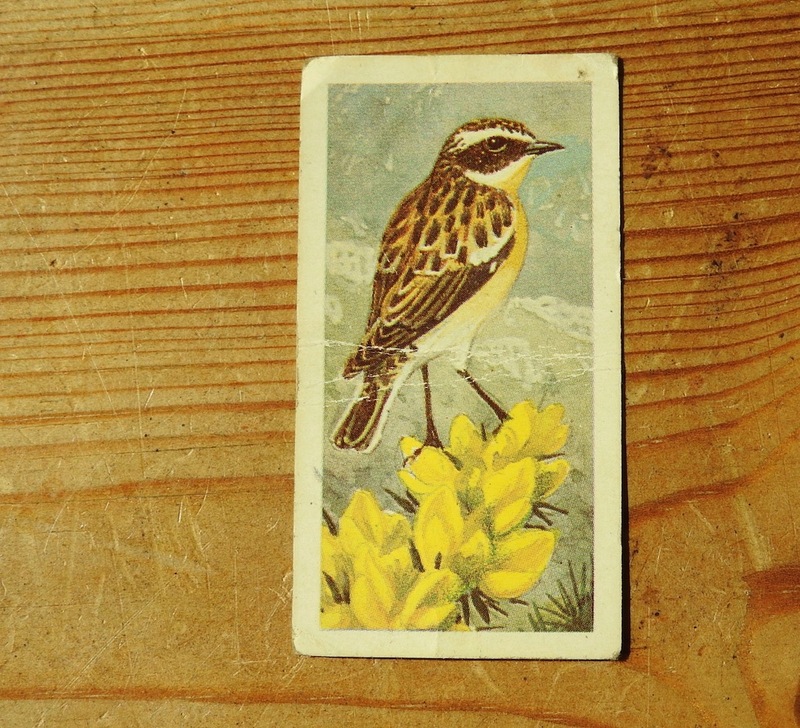 Not sure why I kept it until this morning, as I’ve never seen a Whinchat sitting up in gorse before and Mr Charles Tunnicliffe* had made the scene look so darn attractive to a young birder a very long time ago… almost SNAP! 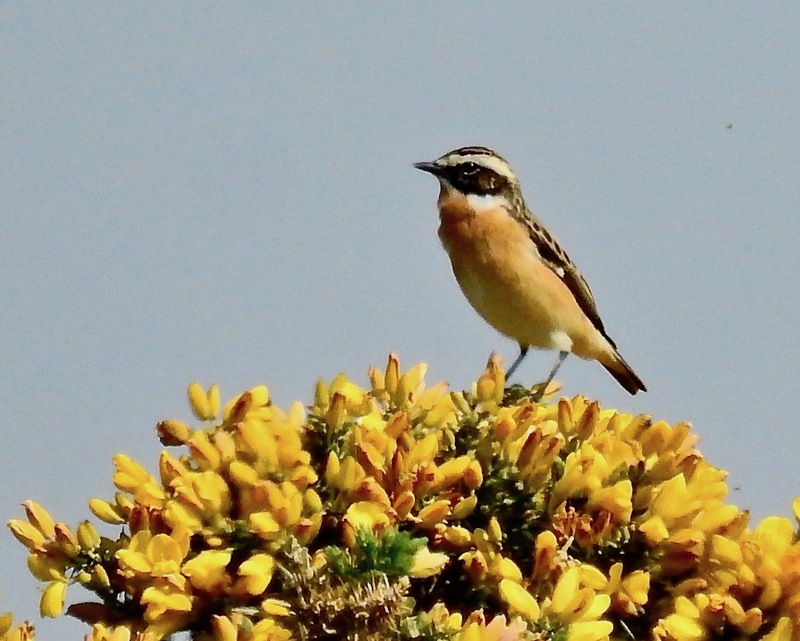 “The spritely Whinchat is a summer visitor to Britain, appearing about mid-April and leaving us again in September or early October to winter in tropical Africa. 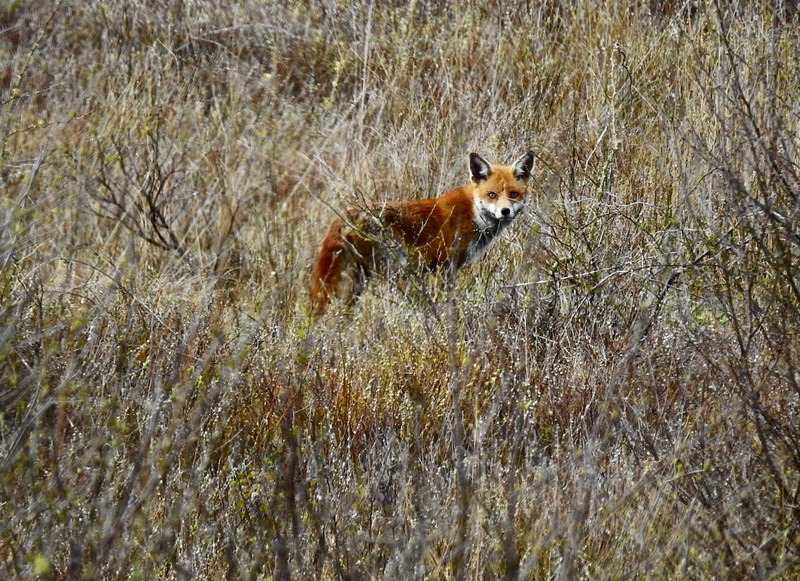 It is a haunter of heaths and rough lands, and is often seen on pastures and in railway cuttings as it hunts for beetles, wireworms, flies and other insects. 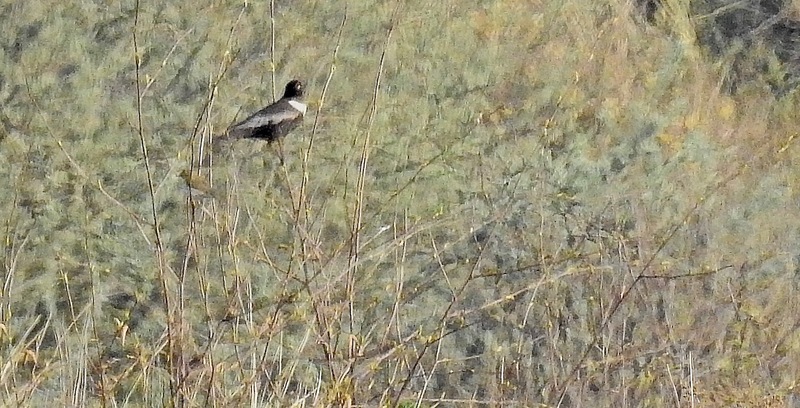 The nest is placed close to the ground, in low herbage or low shrubs. 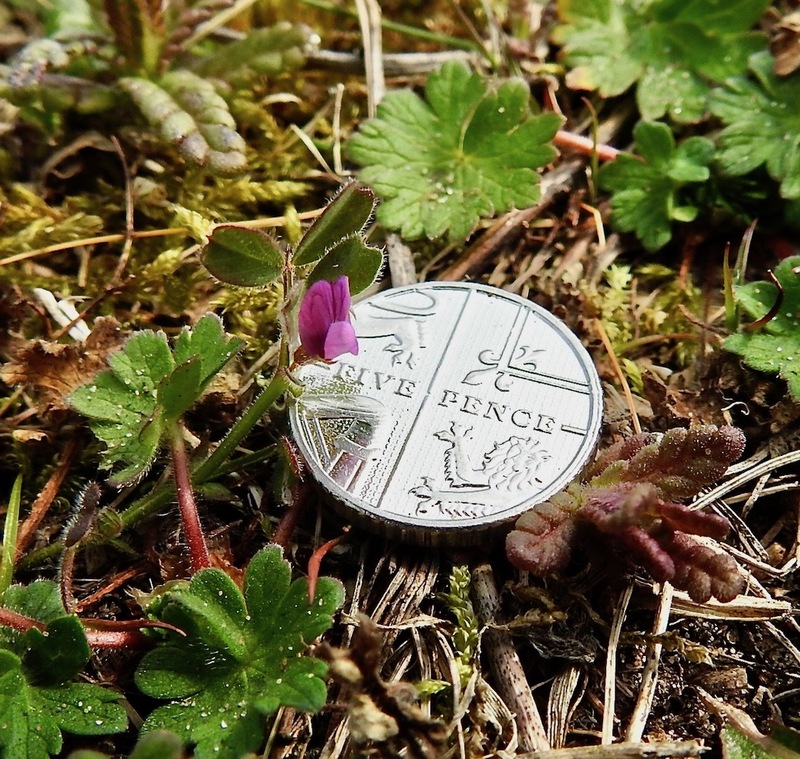 It is loosely constructed of dry grass and moss and is lined with hair and fine fibres. Only the hen builds the nest while the male accompanies her”. 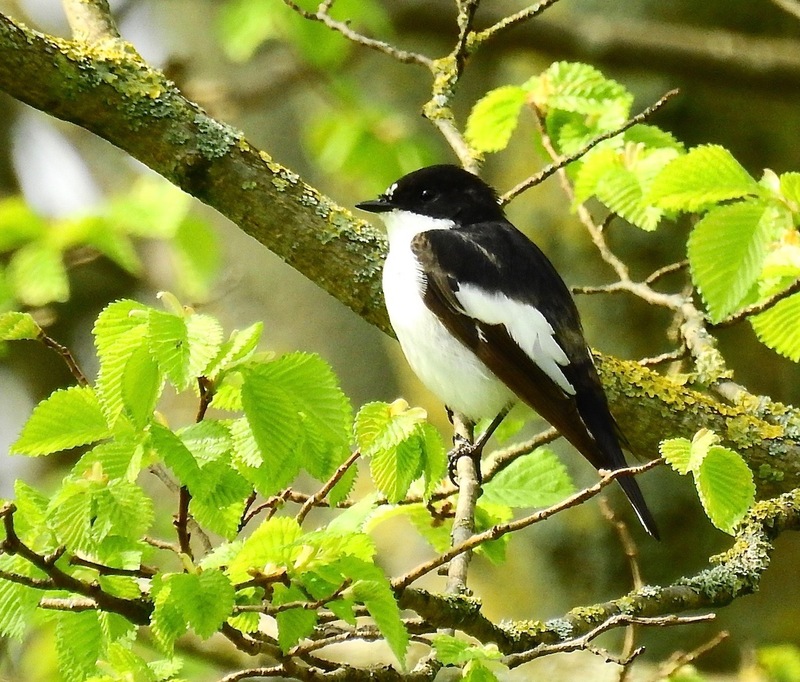 After four hours walking the dunes from 7.30am, it was Les Brown’s discovery of a charming male Pied Flycatcher in Hesketh Park that was bird of the day – an obliging stunner. I only got to it by mid-afternoon, when it sang briefly, but so quietly I could barely hear it above the Chaffinches, Nuthatches, Willow Warblers and Southport background drone. The flycatcher was typically hyperactive, zipping around the canopy in the south east corner of the park. 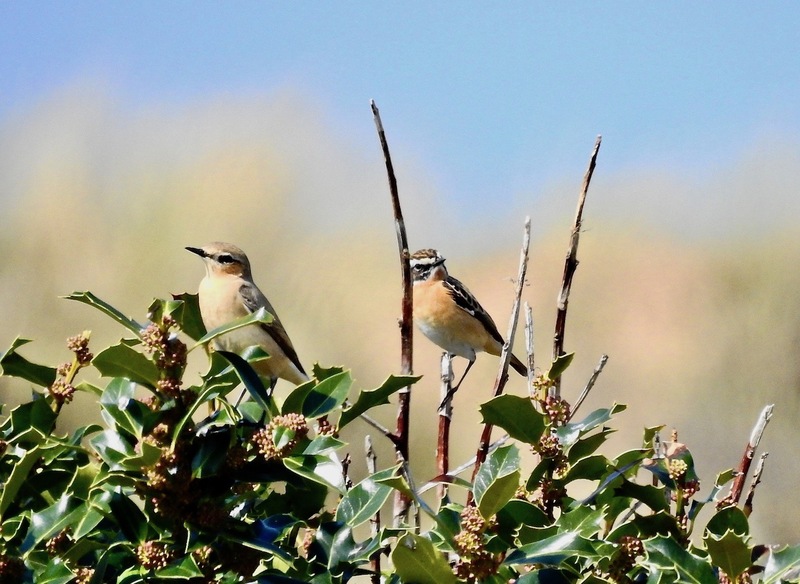 My earlier walk into the dunes south of Shore Road was pretty good too – rising temperatures after mist, new Whitethroats in, the Gropper still reeling and a wonderfully bizarre fly-through Bar Headed Goose, heading north, which I assume was the Marshside escapee on a day-trip. Willow Warbler 15, Whitethroat 3, Grasshopper Warbler 1, Whimbrel 1, Wheatear 4, Swallow 20+, Sand Martin 50+, Redpoll 5, Chiffchaff 1, Peregrine 1, plus the usual resident Blackbirds, Mipits, Lapwing and ignominious Bar Headed Goose. 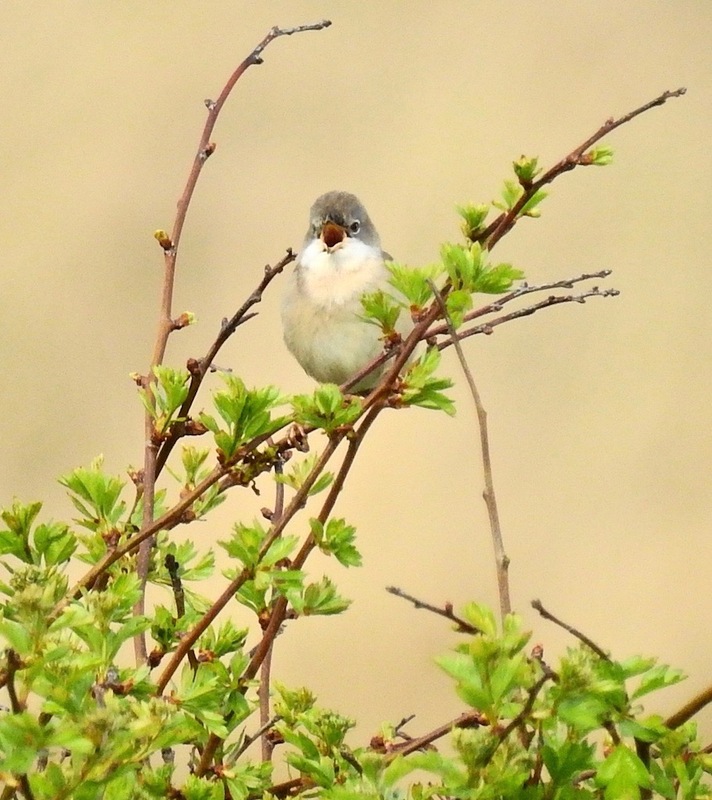 It was a fine morning to be out, with groups of Sand Martins pushing through and Whitethroats tuning up – I’d forgotten how compulsive this patch mullarkey can be, even when the St Mark’s Flies start ganging up on you. 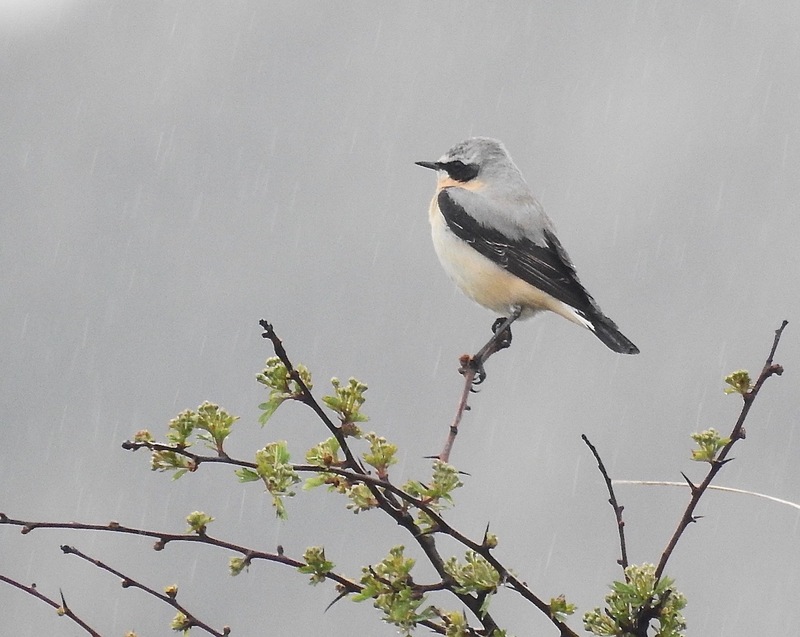 Not to be left out, I had a quick look at Plex in the afternoon, but apart from Orange-Tips and Cowslips in the newly shorn Haskayne Cutting, hirundines firmly back on territory around farm buildings and jangly Corn Bunts, it was pretty quiet, and the lure of the Pied Fly in town was just too strong. 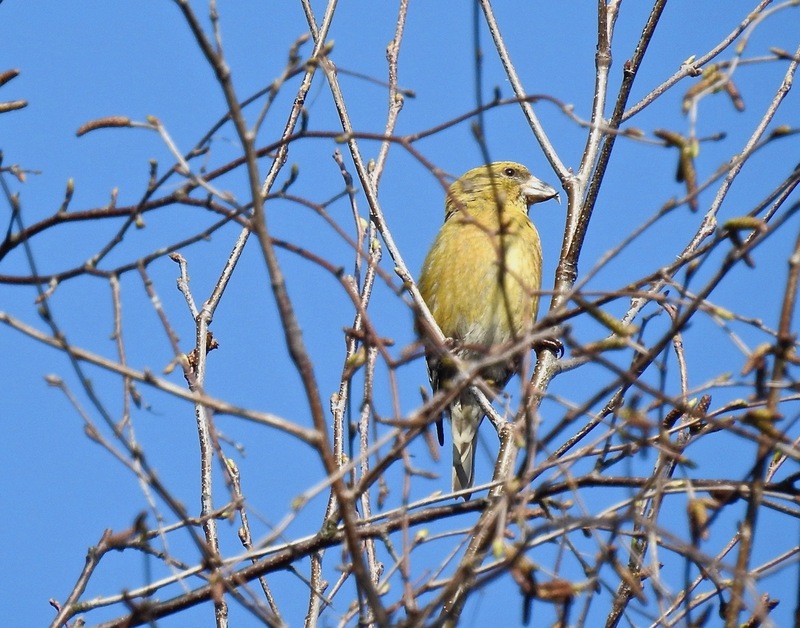 Back home at Dempsey Towers now and a pair of Siskin are on the feeders and a Willow Warbler has joined the singing Chiffchaff in the tall trees down the bottom. Paint me pink and call me sunburnt, but it was warm and sunny in the dunes at lunchtime as I completed my constitutional. 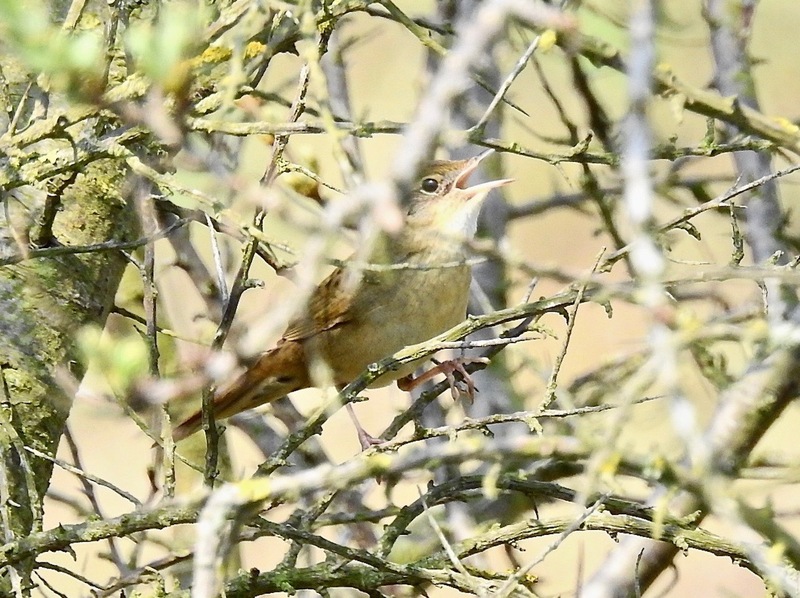 This is of course not a good thing if you are a Natterjack watching spawning pools evaporating faster than a Swallow racing up the coast, but it did prompt my first Grasshopper Warbler of the year into “song” as I walked south from Ainsdale Discovery Centre. 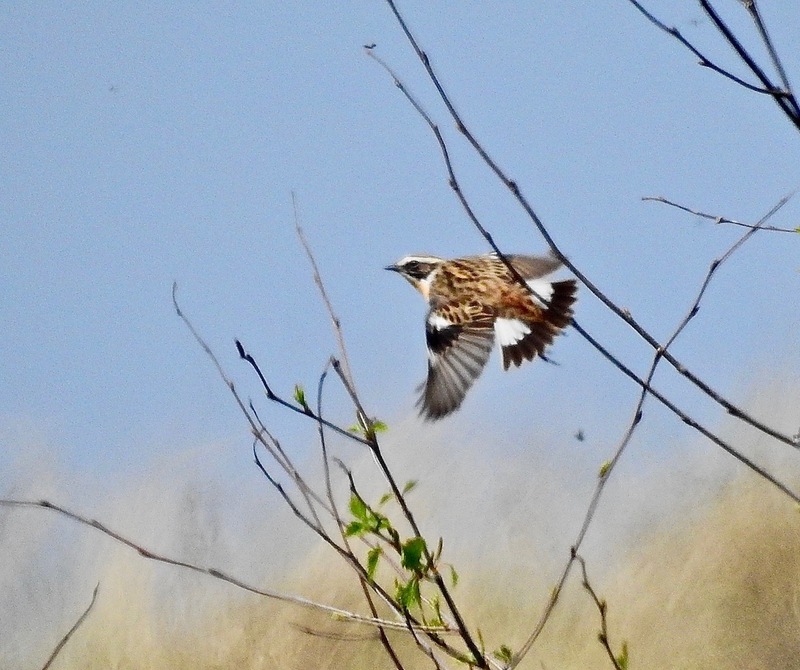 I got fleeting glimpses as it reeled from Sea Buckthorn and briars, but lunchtime was perhaps a bit late in the day to hope for the Gropper to sit out in the open (early doors will be better). 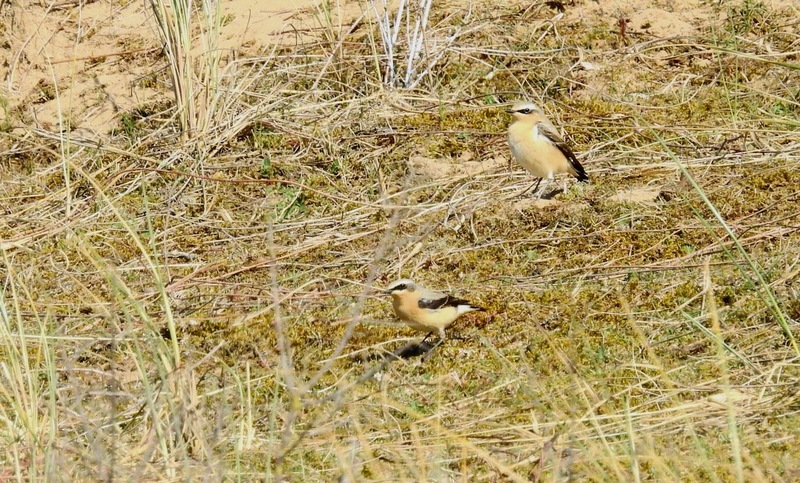 Despite the light winds and all-round clement conditions the dunes were surprisingly quiet – I saw no Wheatears today following yesterday’s mass arrival, Mipit and hirundine passage was light, if steady, and there were fewer Willow Warblers singing on my circuit, perhaps no more than eight. I paused to watch one, when suddenly a vision in powder blue, black and orange caught my eye – a male Redstart darted out of the birch scrub in front of me, pitched down on the sheep-cropped turf, snatched an invert, then whizzed back into cover again. Never saw it again, as is often the way with this species in spring, but I bet it was eyeing me from the deep, dark cover of the branches. I sought consolation in the singing Willow Warbler, which after the dazzling Redstart, I’m ashamed to say looked decidedly plain. One day, all lunchbreaks will be made this way…. The weather was a whole lot more promising this morning with a “new” Chiffchaff singing, crisp and fresh, by the office at Ainsdale and what looked like a male Greenland Wheatear on the roof of the discovery centre first thing. After the brutality of the cold easterlies and blue skies of the last few days the warmth and cloud was reassuring and gave way to drizzle – even better as I headed out for my lunchtime circuit into the dunes. 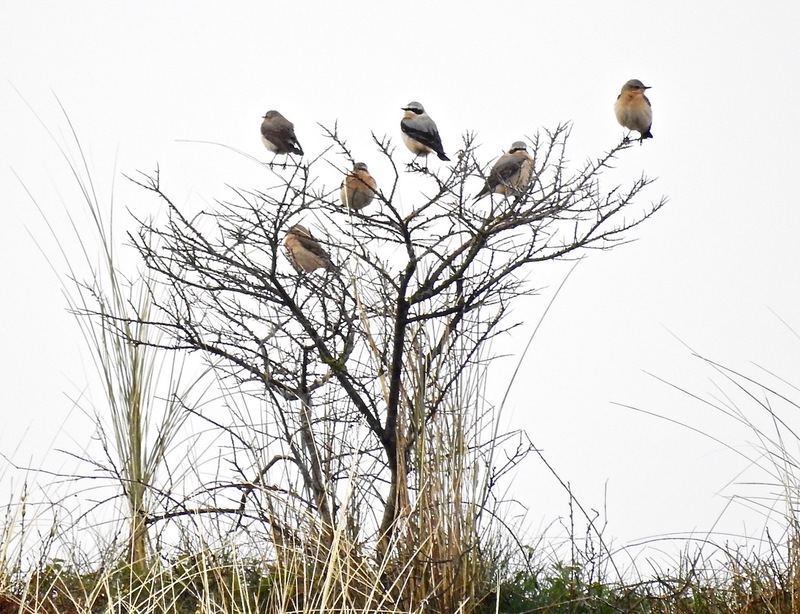 The rain grounded plenty of Wheatears, with six memorably perching together in one exposed Sea Buckthorn on a ridge (I’ll get to you next winter…) and up to 10 in the immediate area. Is a bird in the hand worth six in the bush??? The two pairs of Blackbirds were still skulking around the sheep enclosure, with the male occasionally singing – always a lovely sound in the spring rain – and swallows zinged through. Another blue sky morning, but cold thanks largely to the easterly wind ripping over the dunes as I completed another circuit south of Shore Road, Ainsdale. A few more bits and bobs moving today – three male Wheatears, now up to eight singing Willow Warblers, two Swallows, four Redpoll, two Siskin, one White Wagtail through – thin fare for this far into April certainly, but the temperatures are set to start rising next week, so I’m sure everything will push through then…..
I’ve been trying to get a walk in the dunes at Ainsdale in each lunchtime this last week or so – in a daft, hectic schedule I reckon I can still squeeze a circuit in that takes about 45 minutes south of Shore Road. Don’t manage it everyday, but enough to keep me sane…ish. After all, if your office is just a few steps from the most exciting dune system in England, it seems wrong not to play with it. 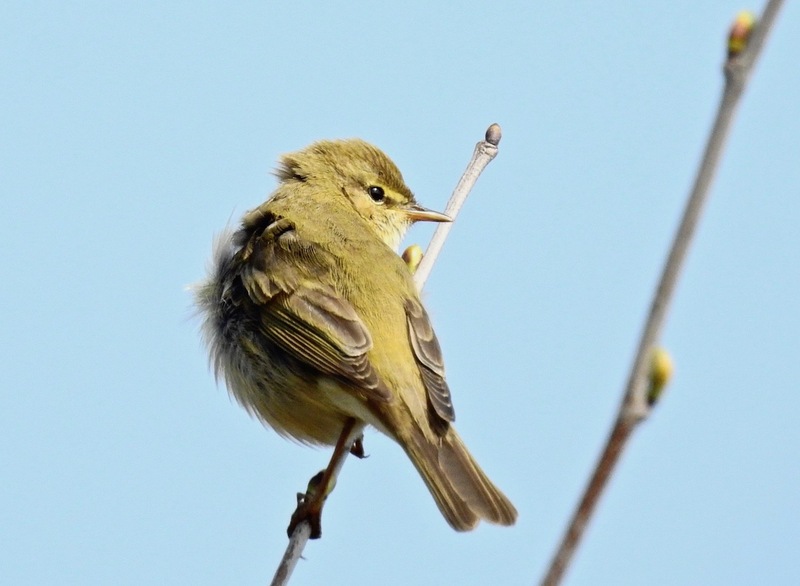 Today was kinda typical, six Willow Warblers singing (but none particularly strongly), which is an increase from the four when they all started up on Sunday. The week has provided a Peregrine, a few Wheatears, and territorial Mipits too of course. Newly vocal Chiffchaffs sing at Dempsey Towers just after dawn, fresh and clean as cut crystal, but the wintering Blackcap has gone. Peacock, Small Tortoiseshell, Orange Tip and Green Veined White were on the wing today, and a survey visit to two pools I’m down to cover, revealed good numbers of Natterjack Toad tadpoles and some new spawn strings, despite the frosty nights. The cold air and the blue, blue skies means there doesn’t seem to be much on the move – although lunchtime is probably the worst time possible to go looking after all – but at least Swallows and a House Martin were struggling through today. The local Buzzards wheel about everywhere, and the odd Redpoll and Siskin head north, but I still live in expectation of Spring really exploding. Plenty of time yet… but sooner rather than later would be good! The chill morning was something of a rude shock at Marshside today, but Swallows, House and Sand Martins were still pushing through. 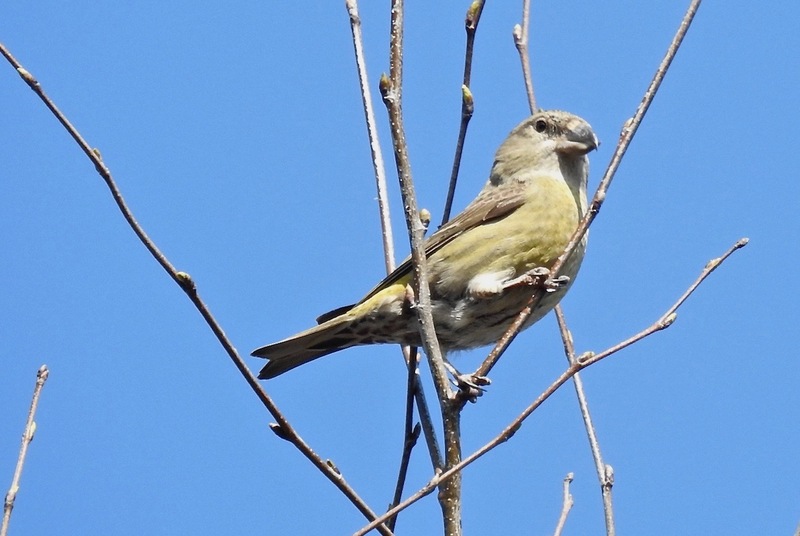 Four or five Chiffchaffs were singing, audible from the public footpath between Hesketh Road and Marshside Road, and a light passage of alba wags and Mipits was bounding north, with one or two buzzy Redpolls mercifully invisible. Blackcap singing too, and I thought I heard a Tree Sparrow calling, but couldn’t pin it down in the scrub. 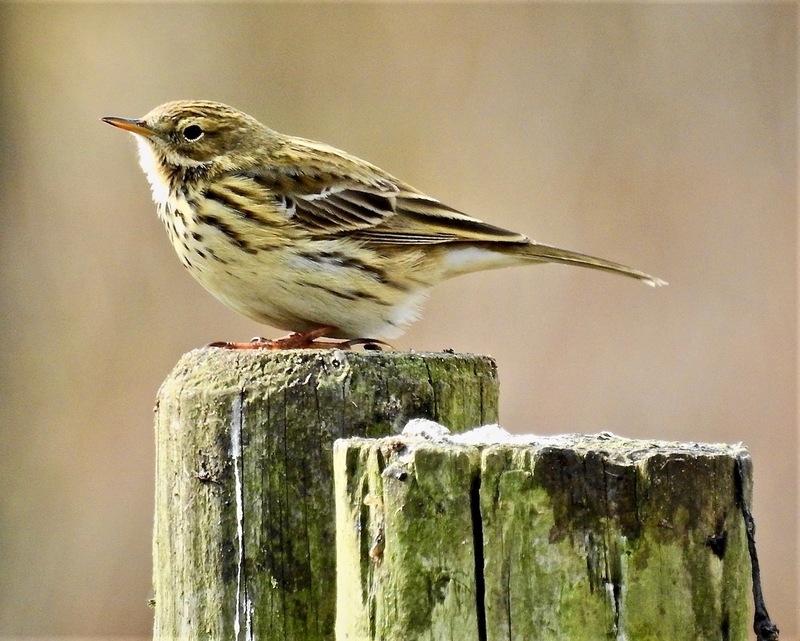 I met up with Bazzo and after a check from the platform we worked the Sandplant – Goldcrest and Chiffchaff were there and seven White Wagtails were on the fenced off area behind. 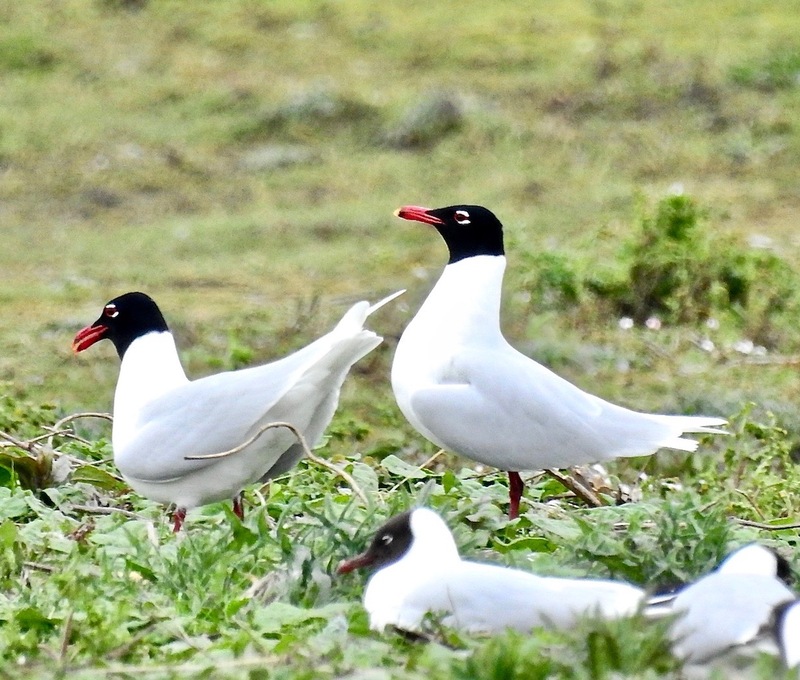 From Sandgrounders a pair of glorious adult Med Gulls were displaying amongst the BHGs, bowing, scraping, stretching and generally throwing weird shapes. 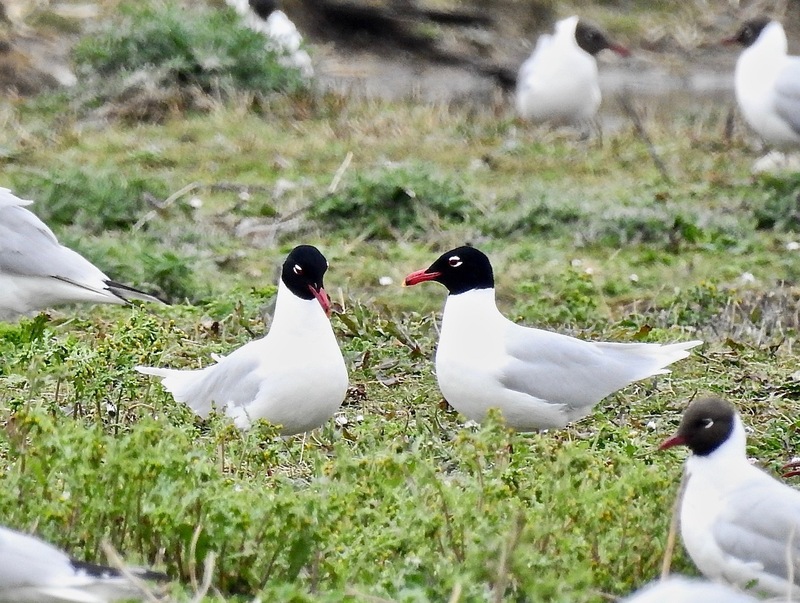 Beautiful birds – blood red eye-rings, white goggles, swan necks and the long white wings of angels – you can see why some birders rate them as the best gull going… (I’m more of a Sabs, or maybe Pallas’s, man myself, but the principle is arguably the same). Out behind Polly’s Creek a Red Legged Partridge was scurrying about, and the pair of Pochard was still on the sandplant lagoon. 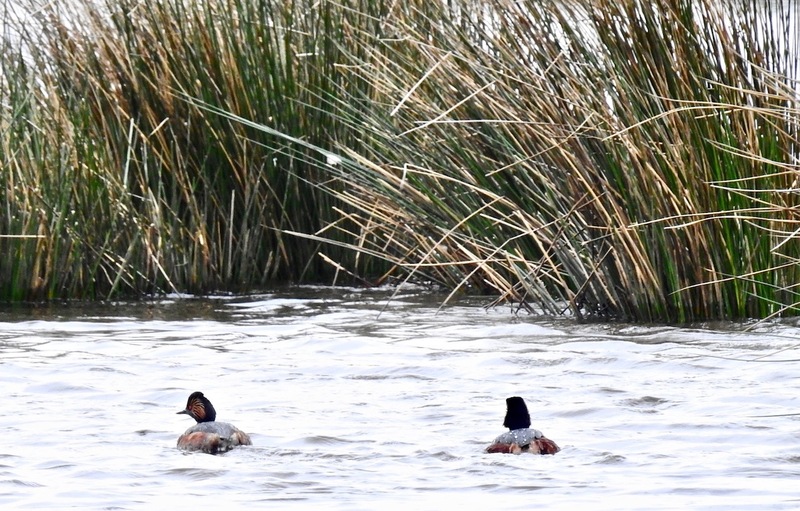 I drove up to Crossens where we grilled a few thousand geese – the six Barnacles were still amongst the Pinks and the two Greenland Whitefronts, all black belly bars and white foreheads, were further out, but reasonable through the ‘scopes. A Peregrine was on the deck out there too. Many more geese were visible in the shimmer out towards Banks and way out of range. On the way home I called into the office at Ainsdale and had a quick look at the dunes south of Shore Road. 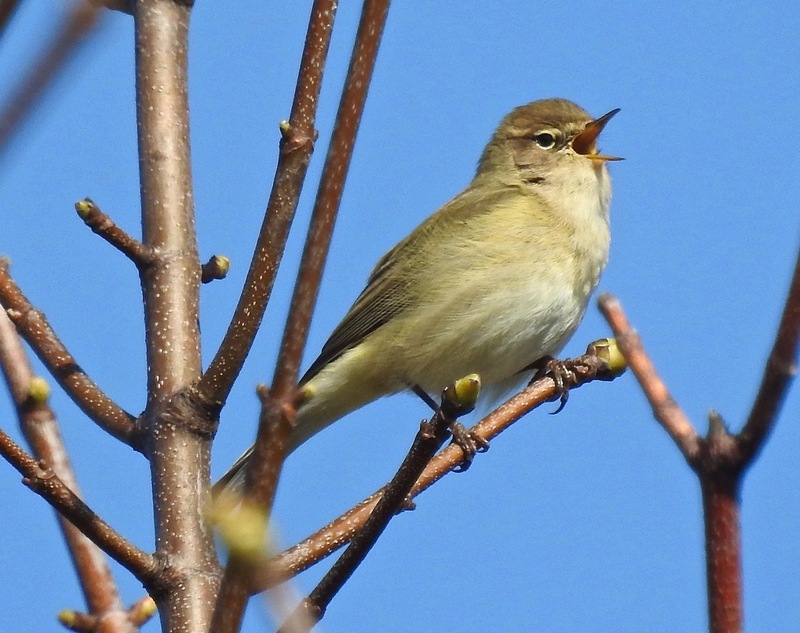 As the afternoon brightened, 3-4 Willow Warblers started singing, my first of the year. The song is as refreshing as a large G&T on a warm, sunny afternoon. The morning rush from my second Osprey of the week stayed with me all day. The bird came through indecently low in the rain at about 0950 while I was in the Green Sefton depot at Ainsdale. 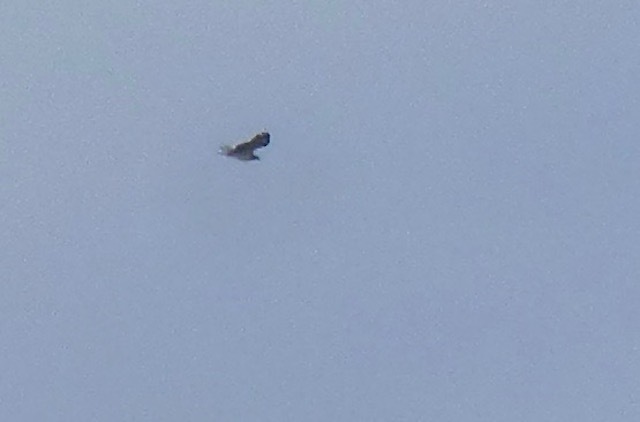 Those give-away angled wings were flapping straight at me lower than rooftop height about 100 metres away. Superb. With my bins and camera safely locked away back at the office, I was reduced to smiling a lot and shouting “Osprey” repeatedly and rather unnecessarily as everyone around me could see the marvellous raptor I was pointing at as it moved through. Tired I guess from battling north in the poor weather, the Osprey flapped over Starr Gate on the other side of the Ribble 25 minutes later on its way north – safe journey. The smile stayed on my face all day and after work I whizzed down to Lunt Meadows to have a look at the pair of Black Necked Grebes that Phil Boardman had kindly told me about earlier in the week (comment on previous entry). 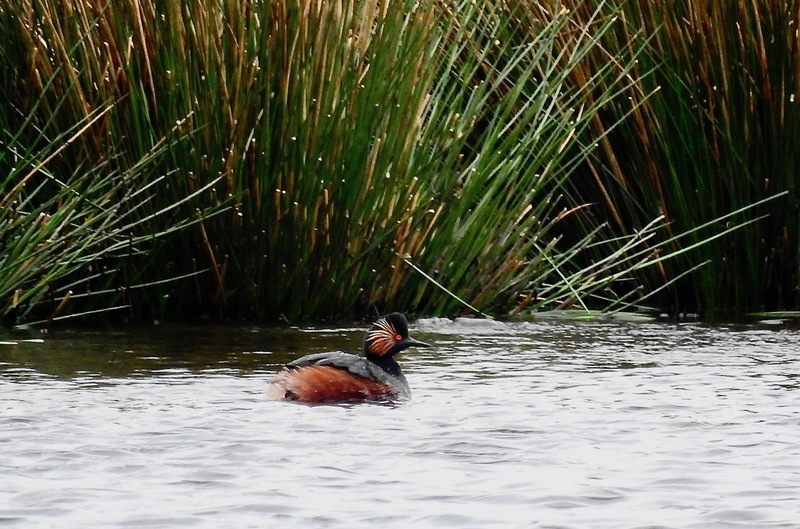 Both in full summer plumage, they were diving and scooting about on the Garganey Scrape in poor light, but were still gorgeous. 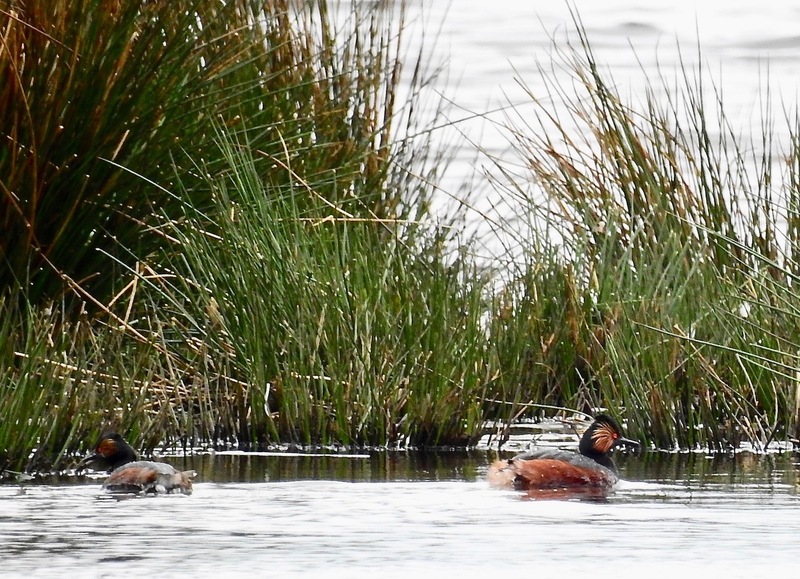 Occasionally they wandered into the clumps of sedges as if prospecting, but they may just have been taking the most direct line to the next patch of open water as they moved south down the reserve. Whenever I tried to take a picture of them together though they generally gave me a 21 bum salute. With Avocets, Blackwits, Snipe and Lapwing on the lagoons, three Swallows meandering about in the cold air overhead and a singing Chiffy or two, this reserve looks better each time I visit – a tribute to all the volunteers who do so much work here with Lancs Wildlife Trust. 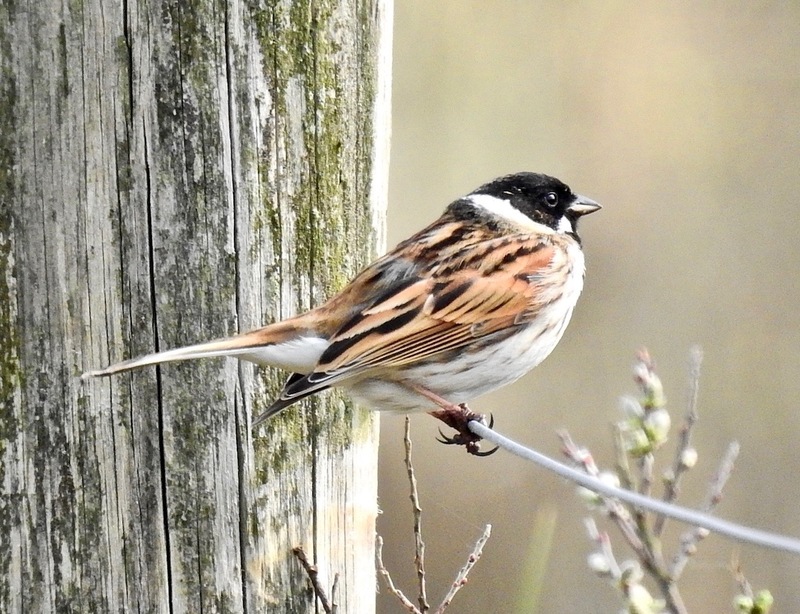 A pair of summer plumage Black Neckeds is the very least they deserve…. Working with the Natural Alternatives crew is always great fun, but a good day got better when this Osprey cruised over us at Crosby Coastal Park today at about 12.30. The raptor was cutting along the edge of the cold north westerly after earlier squalls. It went through so fast the gulls didn’t even get time to mob the Osprey before it disappeared behind the rooftops of Crosby in the direction of Rimrose Valley. The bird seemed to be taking the north easterly inland trajectory that so many of them do from the Mersey mouth. I barely had time to take this crappy point and press record smudge before it was gone…the bird was not stopping on its way north. 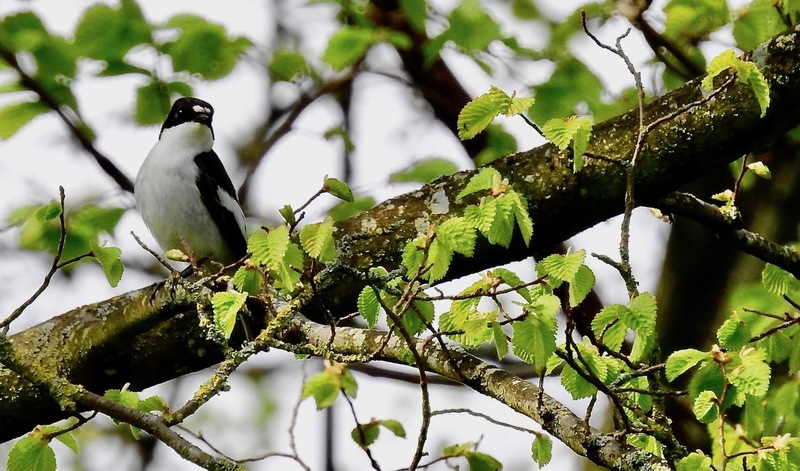 It’s always a treat to see one of these things going through locally in the spring of course – I’m hoping for a Ring Ouzel next…. 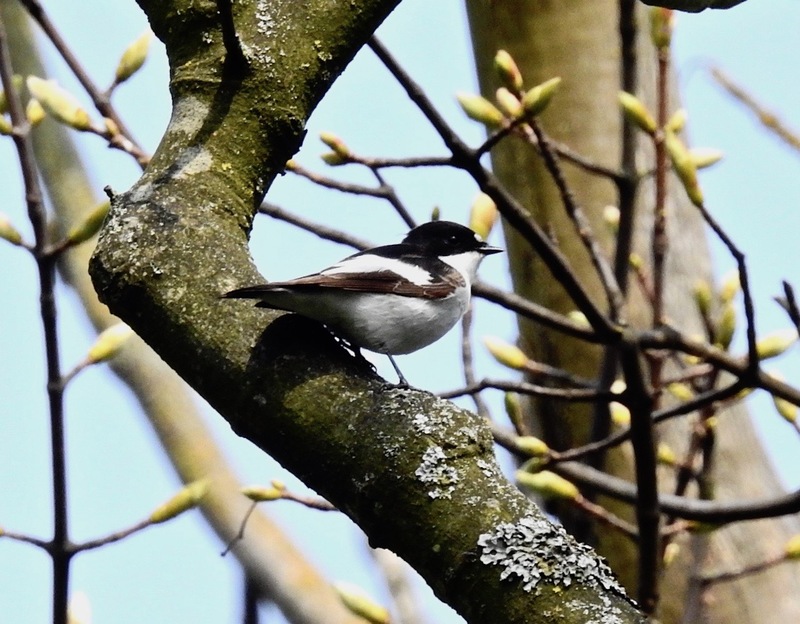 If you fancy joining me for a spot of birding, I’m leading a guided spring migration walk from Ainsdale Discovery Centre (PR8 2QB) at 9am on Friday, April 12th for Green Sefton. To book a place, email GreenSefton@sefton.gov.uk or call 0151 934 2961 – there’s still a few places left – don’t forget your binolikars! If you fancy finding out more about Natural Alternatives, the inclusive access programme, click here. The stores still selling flowers were as Herring balls pillaged by Orcas, so I grabbed an hour or two before all the lovely Mother’s Day stuff this morning and took a stroll in the Local Nature Reserve at Birkdale. 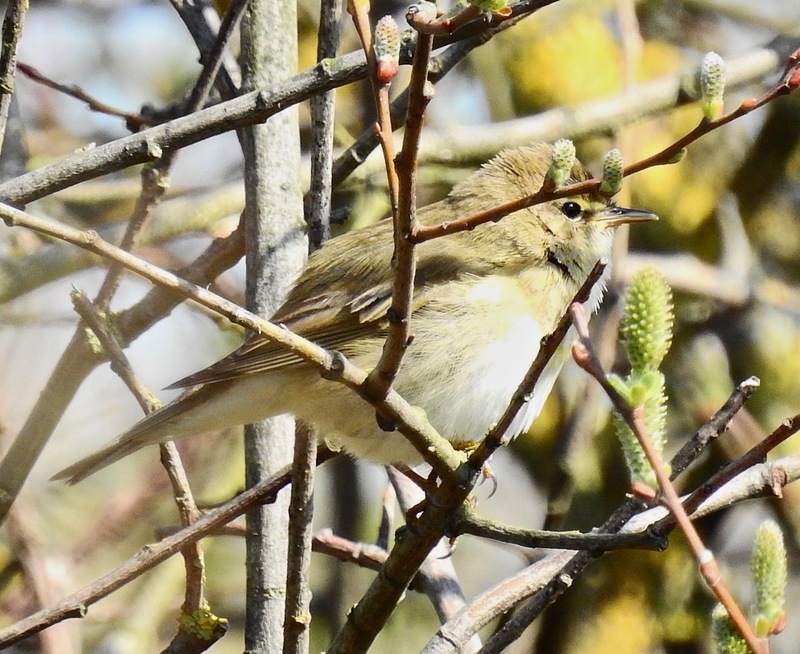 I walked in from the Royal Birkdale side, with Chiffchaffs singing all the way along the trail, a Blackcap tuning up and Siskins, Redpoll, Goldcrests, titmice and Greater ‘Peckers zipping about. 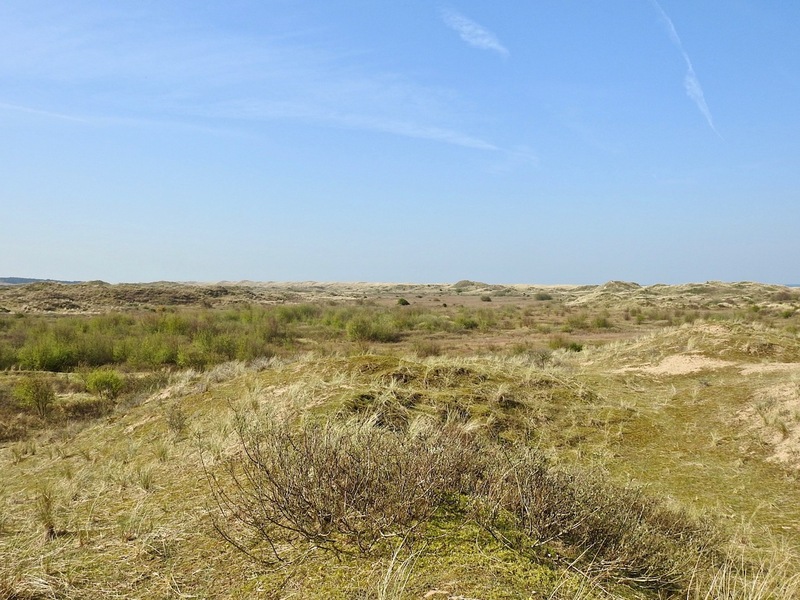 A female Marsh Harrier came in off the sea at 10.30am as I enjoyed the panoramic view from one of the highest dunes (what a place to watch vismig!). Beautiful blue skies saw local Sprawks and Buzzards up. 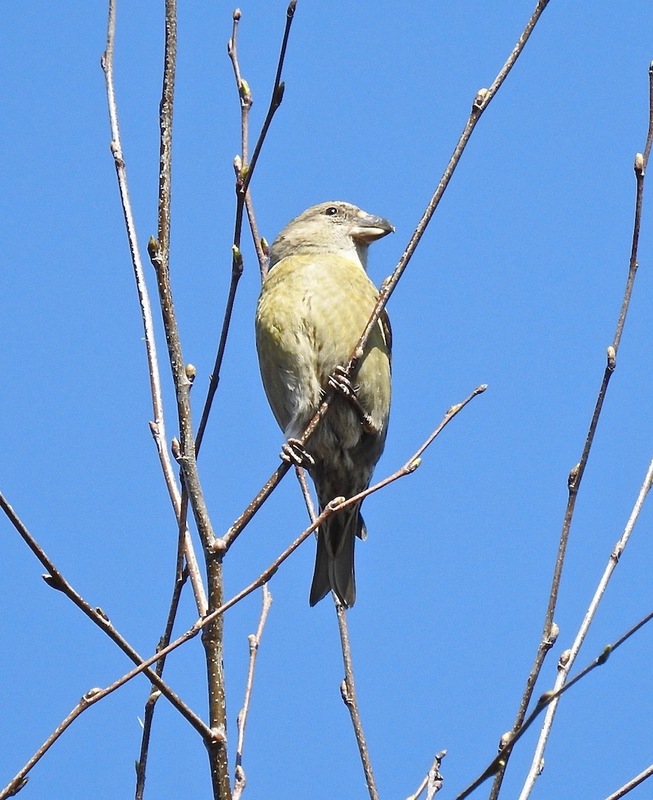 Walking back I came across a pair of Crossbills sitting quietly in the top of birch trees next to the Hillside Golf Course boundary fence. Crossbills have been lingering in this area (or if they’re not there, check the areas around Gate 28 and 29 in the cattle enclosure fence, where I think they come down to drink in the narrow ditch, after all, it’s thirsty work chewing pine resin) for the last month at least, and with another 50 reported in the NNR a week or so back, it looks like a good spring for the big beezered ones. Post breeding dispersal from the north? 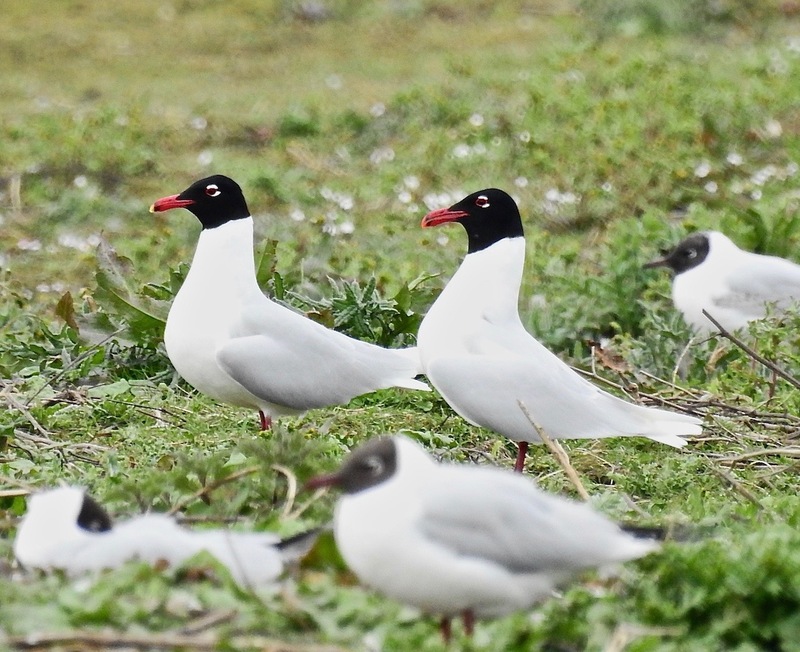 Or birds that maybe be settling on the coast again – last time they bred here in numbers they seemed to be significantly later nesting than ones further north, which are often found brooding in January with the Speyside snow dusting their backs….